This entry was posted on March 22, 2019 by Sew Essential. 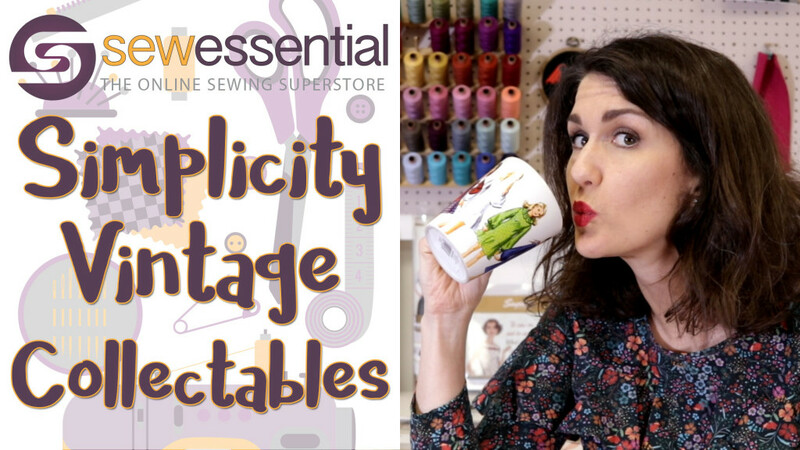 If you love sewing you're going to love our new Simplicity Vintage Collectables. Delightful vintage sewing themed stationery, home-wares, bags and sewing goodies sooo pretty you will want to collect them all. The impeccable style of the 30s, 40s, 50s, 60s and 70s immortalised on keepsakes you will treasure forever. Who knows you might even decide to treat a friend too. Hi everyone and welcome to the Sew Essential vlog. I'm here today to bring you a really exciting new range of products by Simplicity. They are all vintage themed with different ranges through the ages 30s, 40s, 50s, 60s and 70s and I know you are going to love them. They are available on our site here. Let's start with this desk organiser - it looks like a simple box with a lovely image on the top. Open it up and it is actually a desk tidy complete with mini post it notes, a notepad, room for paper clips and similar items and a pencil pot. Plus it has a fun meme 'act like a lady, think like a boss'. What a great way to keep your office area and desk tidy. We also have these lovely notebooks, which have the most gorgeous image on the front and then look inside at the pages. The pages are lined with pretty images at the bottom of each page. There's also a pretty desk organiser set complete with memo pads, cards and envelopes plus little stickers for reminders etc. So all of these things are a great way to cheer things up in your office area because, let's face it, work can be a bit dull sometimes! This pack of stickers goes alongside the stationery to you help plan sewing projects. I love these paper doll kits. I remember having one of these as a little girl and I used to love dressing it up. This one comes with five different outfits with accessories, a folder, base and the doll itself. Such a pretty and inspiring trinket for your work area. Look at these amazing mugs, which come with designs from a range of eras. This is the 1970s one, just look at the gorgeous images, I'm sure this would put a smile on my face every time I have a sip of tea in my sewing room. To go with the mugs we have these adorable coasters with fun slogans on them: 'fancy a fancy evening' with a lady in a ball gown, 'beauty sleep' with a Simplicity night gown. These would add a lovely sewing theme touch to other areas of your home. There are also these gorgeous tea towels that state 'paper towels are jealous'. I bet they are! I would love to have one of these hanging in my kitchen. I'm sure we have some of the actual patterns featured on some of these products too. All of the pattern numbers are featured so you know which patterns they are. If you fancy putting a pretty picture up in your sewing room how about one of these cute canvas sewing themed prints? If you want something bigger we also have posters, which are 30cm by 91cm. These beautiful decals can be added to a wide range of surfaces you just rub them on. How amazing would this look on a glass tumbler for your G&T? I bet it would be the envy of all your friends. You can jazz up your fridge with these magnets too. These pack away tote bags come in a range of eras and are a great reusable shopping bag. Once you've finished shopping you can neatly pack it away in the little pouch. We also have these lovely canvas tote bags, which are made from durable fabric and will last a lifetime I'm sure. There are also some smaller bags which would be ideal for keeping sewing bits and bobs in. When I'm sewing I like to have a little bag with my essential kit next to me - my little scissors, chaco pen, tape measure, sewing machine feet. I think one of these would be ideal and mine might be getting an upgrade! There are some gorgeous vintage sewing tins for keeping things tidy in an oh so stylish way. This one would be ideal for buttons or other sewing notions. This one comes with sewing notions inside - thread, a seam ripper, a thimble, some needles, a pair of scissors and a tape measure. We have some pretty vintage sewing scissors and tape measures too - stylish and useful, win win! These key rings and brooches/badges are a great way to accessorise. Wear the brooches on a lapel of a coat or jacket or perhaps attach them to a bag. The key ring would make sure you never lose your keys and would also look lovely on a bag. Slipping one of these super stylish book marks inside my book every night would always make me smile and remind me of one of my other favourite hobbies. What a lovely way to remember your page. Finally you can customise projects with these appliques and iron on transfers. I hope you've enjoyed that as much as I have. Remember you can check everything out on our website for further details. For more tips and tricks on how to make sewing easy you can follow our blog via Bloglovin and receive updates via email each time a new post is added.